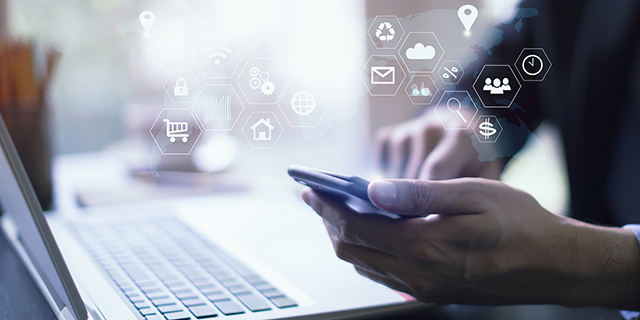 Amid public concerns over Cambridge Analytica’s use of Facebook data and a subsequent movement to encourage users to abandon Facebook, there is a renewed focus on how social media companies collect personal information and make it available to marketers. Pew Research Center has studied the spread and impact of social media since 2005, when just 5% of American adults used the platforms. The trends tracked by our data tell a complex story that is full of conflicting pressures. On one hand, the rapid growth of the platforms is testimony to their appeal to online Americans. On the other, this widespread use has been accompanied by rising user concerns about privacy and social media firms’ capacity to protect their data. All this adds up to a mixed picture about how Americans feel about social media. Here are some of the dynamics. 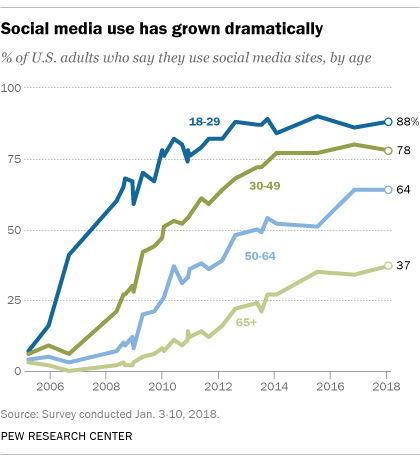 About seven-in-ten American adults (69%) now report they use some kind of social media platform (not including YouTube) – a nearly fourteenfold increase since Pew Research Center first started asking about the phenomenon. The growth has come across all demographic groups and includes 37% of those ages 65 and older. The Center’s polls have found over the years that people use social media for important social interactions like staying in touch with friends and family and reconnecting with old acquaintances. Teenagers are especially likely to report that social media are important to their friendships and, at times, their romantic relationships. Beyond that, we have documented how social media play a role in the way people participate in civic and political activities, launch and sustain protests, get and share health information, gather scientific information, engage in family matters, perform job-related activities and get news. Indeed, social media is now just as common a pathway to news for people as going directly to a news organization website or app. Our research has not established a causal relationship between people’s use of social media and their well-being. But in a 2011 report, we noted modest associations between people’s social media use and higher levels of trust, larger numbers of close friends, greater amounts of social support and higher levels of civic participation. While there is evidence that social media works in some important ways for people, Pew Research Center studies have shown that people are anxious about all the personal information that is collected and shared and the security of their data. Overall, a 2014 survey found that 91% of Americans “agree” or “strongly agree” that people have lost control over how personal information is collected and used by all kinds of entities. Some 80% of social media users said they were concerned about advertisers and businesses accessing the data they share on social media platforms, and 64% said the government should do more to regulate advertisers. 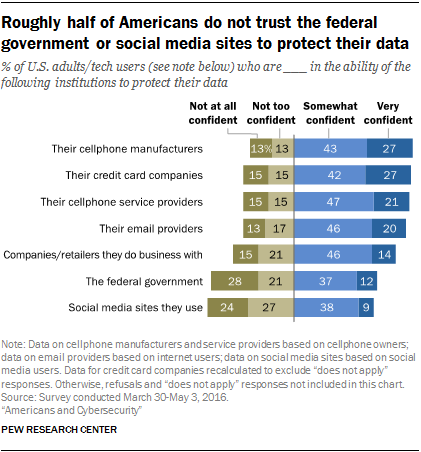 Another survey last year found that just 9% of social media users were “very confident” that social media companies would protect their data. About half of users were not at all or not too confident their data were in safe hands. Moreover, people struggle to understand the nature and scope of the data collected about them. Just 9% believe they have “a lot of control” over the information that is collected about them, even as the vast majority (74%) say it is very important to them to be in control of who can get information about them. Six-in-ten Americans (61%) have said they would like to do more to protect their privacy. Additionally, two-thirds have said current laws are not good enough in protecting people’s privacy, and 64% support more regulation of advertisers. Some privacy advocates hope that the European Union’s General Data Protection Regulation, which goes into effect on May 25, will give users – even Americans – greater protections about what data tech firms can collect, how the data can be used, and how consumers can be given more opportunities to see what is happening with their information. Moreover, social media users can be turned off by what happens on social media. For instance, social media sites are frequently cited as places where people are harassed. 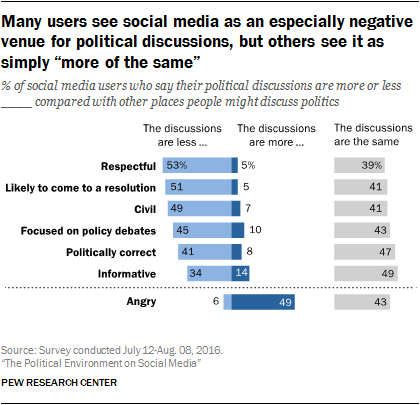 Near the end of the 2016 election campaign, 37% of social media users said they were worn out by the political content they encountered, and large shares said social media interactions with those opposed to their views were stressful and frustrating. Large shares also said that social media interactions related to politics were less respectful, less conclusive, less civil and less informative than offline interactions. A considerable number of social media users said they simply ignored political arguments when they broke out in their feeds. Others went steps further by blocking or unfriending those who offended or bugged them. Why do people leave or stay on social media platforms? The paradox is that people use social media platforms even as they express great concern about the privacy implications of doing so – and the social woes they encounter. The Center’s most recent survey about social media found that 59% of users said it would not be difficult to give up these sites, yet the share saying these sites would be hard to give up grew 12 percentage points from early 2014. Some of the answers about why people stay on social media could tie to our findings about how people adjust their behavior on the sites and online, depending on personal and political circumstances. For instance, in a 2012 report we found that 61% of Facebook users said they had taken a break from using the platform. Among the reasons people cited were that they were too busy to use the platform, they lost interest, they thought it was a waste of time and that it was filled with too much drama, gossip or conflict. In other words, participation on the sites for many people is not an all-or-nothing proposition. People pursue strategies to try to avoid problems on social media and the internet overall. Fully 86% of internet users said in 2012 they had taken steps to try to be anonymous online. “Hiding from advertisers” was relatively high on the list of those they wanted to avoid. Many social media users fine-tune their behavior to try to make things less challenging or unsettling on the sites, including changing their privacy settings and restricting access to their profiles. Still, 48% of social media users reported in a 2012 survey they have difficulty managing their privacy controls. After National Security Agency contractor Edward Snowden disclosed details about government surveillance programs starting in 2013, 30% of adults said they took steps to hide or shield their information and 22% reported they had changed their online behavior in order to minimize detection. One other argument that some experts make in Pew Research Center canvassings about the future is that people often find it hard to disconnect because so much of modern life takes place on social media. These experts believe that unplugging is hard because social media and other technology affordances make life convenient and because the platforms offer a very efficient, compelling way for users to stay connected to the people and organizations that matter to them. Note: See topline results for overall social media user data here (PDF).